Last year I hosted a successful lake shore barbecue and beef kabob was one of hottest choice. Everybody loved it. The BBQ season has started for this year, I will definitely make some more of it. The Kabob is so easy to make, and it is just a matter of preparing the ingredients. 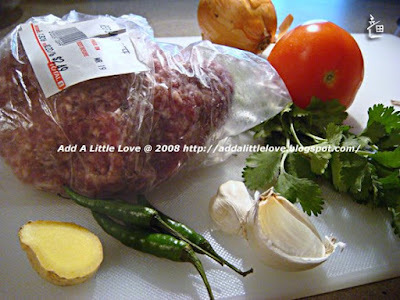 Ground beef, onions, tomato, cilantro, green chili, garlic, ginger, egg white, potato starch, vegetable oil, a pack of Kabob Spicy which can be found in any Indian or Pakistani grocery stores.